CINCH, Community INformation CHristchurch contains information for around 6,000 organisations, courses and individuals. 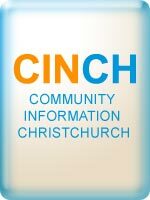 CINCH is an online community directory containing information for around 6,000 community organisations, clubs and continuing education providers in Christchurch. It also includes some organisations in the Hurunui, Selwyn and Waimakariri districts. You can also find continuing education providers and follow website links to get their latest course information, add or update your organisation's details and follow links to gain access to other websites of community interest. Created by Christchurch City Libraries in 1981, CINCH covers metropolitan Christchurch and has grown to include the area between the Ashley and Rakaia Rivers and inland to Springfield. Ski fields, camp sites and golf courses outside this area are also listed. To keep information as up to date as possible, Christchurch City Libraries contacts every organisation listed annually. Not all organisations respond, so each listing contains the date of the last successful contact with an organisation. Google maps for finding organisations' locations quickly and easily. Christchurch City Libraries reserves the right to include or exclude any listing.